Rick and Morty vs. Dungeons & Dragons #1 Review – AiPT! A fantasy lover’s dream come true combining two of the nerdiest things in existence. 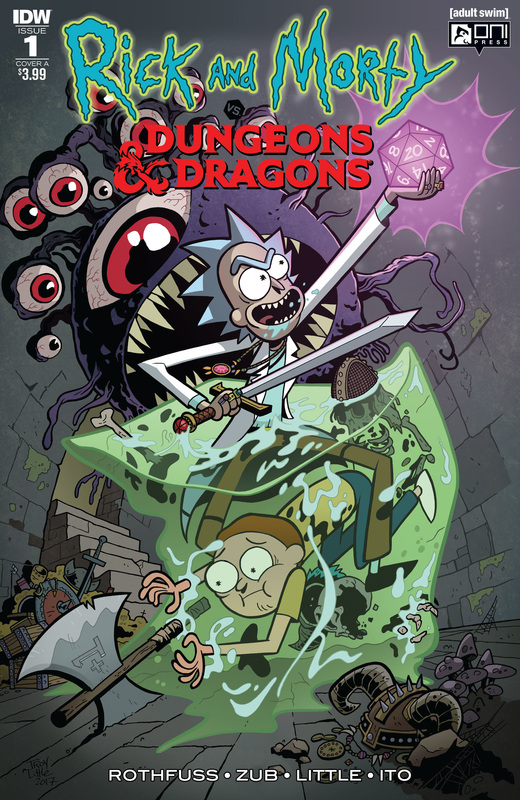 The crossover event that makes more sense than any other that has come before it is here and it brings Rick and Morty into the realm of Dungeons and Dragons. Seriously, if you like one you probably like or at least have heard of the other. In this crossover Morty must master the realm of D&D so he can get chicks. Wait, really? This series is written by Patrick Rothfuss and Jim Zub, both of whom are very good at what they do. Zub is a comic book writer extraordinaire and is one of the main writers over at Marvel Comics. Rothfuss is writing the best fantasy series going right now (and maybe ever, The Kingkiller Chronicle). With their combined powers, and the talents of Leonardo Ito (colorist), we are in for a treat. He looks scared. Credit: Oni Press. And a treat is had by all with this first issue. I couldn’t believe how much content was packed into this issue, giving readers the basic plot of not one, but roughly two normal comic book issues. It’s a standard sized issue, but it not only sets up the conflict but has Morty go through a few trials too. It’s also stuffed with D&D nerd knowledge and references. Having only played D&D once most of them went over my head, but I can appreciate the effort put in to be thorough. The biggest treat of this issue is how much Rick is into Dungeons and Dragons, which is a natural thing seeing as he’s an older guy who probably played in his youth. As is customary with this series the appropriate jokes are made (like Rick putting Morty through hell or Morty’s obsession with his nether regions getting him in trouble) but it also verges into the fantasy jokes too. Given how much series co-creator Dan Harmon is into fantasy (he created HarmonQuest), I can only imagine he’ll love this issue as much as I did. I was also surprised by how good this issue is drawn by Troy Little and Leonardo Ito; not because Little is by any means bad, but because I’ve seen my fair share of artists tackle Oni Press’ main series and trip up. Little’s style is very clean, combined with Ito’s slight cel-shaded look that makes the characters and their environment pop. The gore jokes work well thanks to some well-rendered innards and Morty’s awkward nature shining through. Poor Morty. He’s just a horny teen. Credit: Oni Press. A lot of the Dungeons and Dragons stuff went over my head which can be frustrating. That’s on the reader though, especially with D&D written on the cover, but it’s worth noting casual fans may not get the full enjoyment out of this reading experience. A great issue that is, dare I say, the best Rick and Morty comic on the shelf this week. This issue hits the ground running, revels in the fantasy genre, and is a delightful page-turner. A fantastic first issue in a crossover made in heaven.